As far back as she can remember, Polly Updegraff Champ '61 of Cromwell, Conn., has been a performer. Throughout her colorful and storied life, these eclectic performances have taken place in high school gymnasiums, community and college theaters, classrooms, nightclubs, churches, soccer and baseball fields, and tennis courts. "I loved to dance, sing, act, and play sports," says Polly. "So, I just did them all." 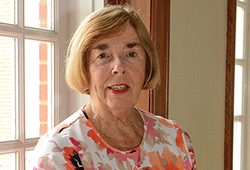 At Mary Washington, Polly majored in dramatic arts and speech, held leadership roles in numerous arts organizations, and participated in community theater for children. While performing was in her blood, Polly says she came from a practical family. That practicality gene led her to also pursue and receive certification in secondary education. After graduation, Polly moved to California. She performed in plays, experimented with comedy in a local nightclub, began teaching high school drama and modern dance, and enrolled in the UCLA theater program. In 1964, she returned to Connecticut and applied her theater expertise and finely honed listening skills to the field of social work. "I had a few behavior issues when I was growing up," says Polly. "Thanks to inspirational teachers, I was able to refocus my energies into drama and later into a YWCA counseling training program." Those experiences translated well into professional positions with the Girl Scouts and throughout her 33-year career with the Connecticut Department of Children and Families. "I've always felt kids of all ages should have someone pulling for them," says Polly. Her philosophy of caring for and helping young people — plus memories of her own struggles — led Polly to establish a need-based scholarship at Mary Washington. "Money was tight at home," says Polly. "My Aunt Weezie lived in Richmond and knew Dr. Simpson, so that's how I ended up at Mary Washington. I worked to pay my expenses, and my parents sacrificed a lot to cover my tuition. Then, my dad lost his job. Miraculously, ananonymous donor and other family and friends provided funds so I could complete my education." To celebrate her 40th reunion in 2001, she established the Polly Updegraff Champ '61 Scholarship in honor of her parents, Rolland Ruch and Virginia Blasingame Updegraff; her aunt and uncle, Eloise Blasingame and Richard Florence; her junior high school guidance counselor, Mary Lou Aiken; and that anonymous donor. Polly's generosity and nostalgic feelings for Mary Washington continue. She still supports the Claudia Read Scholarship and the Fund for Mary Washington, and she has made plans in her estate to provide additional funds for her scholarship endowment. In June of 2016, Polly attended her 55th reunion and the groundbreaking ceremony for the amphitheatre restoration. "Being back there and remembering what it was like when I was a student was so inspirational," she says. "I decided on the spot to write a check equal to my class year so it could be matched by another $1,961 in the Amphitheatre Challenge." Polly and her husband, Dan, are enjoying their retirement. She remains involved in theater, opera, and church near their homes in Connecticut and Florida, and she continues to work as a professional dresser. "I've helped dress celebrities and professionals in Broadway touring shows, operas, rock shows, and even wrestling," she says. "That's one thing about a liberal arts education from Mary Washington. It provides you with a strong background so you can be flexible and adapt to challenges and opportunities at different times in your life."